Pianist Randy Weston headlines the artist lineup and tickets are now on sale for the 15th annual Jazz Journalists Association Jazz Awards gala, to be held on Saturday, June 11, from 1 pm to 5 pm EDT at City Winery in New York City. Performers besides Weston include trumpeter Wallace Roney’s sextet, Canadian flutist/soprano saxophonist Jane Bunnett in duet with Cuban-born pianist Hilario Duran, singer Gregory Porter (a nominee for the JJA's 2011 Male Vocalist of the Year Award) and the Hammer Klavier Trio from Hamburg, Germany. 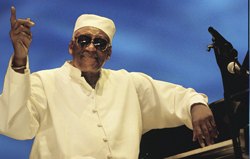 Jazz Awards headliner Randy Weston, 85 years old and a recently named Guggenheim Fellow, is a nominee for the JJA's 2011 Best Book of the Year Award for his autobiography African Rhythms ("arranged" by former JJA vice president Willard Jenkins). Jazz-soul singer Gregory Porter will be also be performing at the gala. Porter is a 2011 nominee for the JJA's Best Male Singer of the Year award and his album Water was nominated for a Grammy as vocal jazz cd of the year. Weston's and Porter's performances are being supported by Motema Records. Pianist Hilario Duran, born in Cuba and residing in Canada, has been nominated for two Juno Awards for his 2010 album Motion, hailed as #1 of the year by the Latin Jazz Network. Soprano saxophonist/flutist Jane Bunnett, a multiple Juno winner who led her Spirits of Havana ensemble at the 2009 JJA Jazz Awards, has been Duran's guest artist on tour with a 13-piece Latin Jazz band. Their performance at the Awards gala is supported by Alma Records, which will release their new album "Cuban Rhapsody" on June 7 in the U.S. and Canada. The performance by acclaimed trumpeter Wallace Roney and his band with his brother Antoine and Arnold Lee on saxophone is being supported by HighNote/Savant Records. The Hammer Klavier Trio, presented by Jan Matthies Music Management, is the subject of a JJA-nominated Short Form Video of the Year, and the group appears at the Jazz Awards as part of its debut American tour. Other surprise musical guests are expected at the June 11 JJA Jazz Awards gala, which will be hosted by Josh Jackson, winner of the 2010 Willis Conover-Marian McPartland Award for Broadcasting and host of The Checkout from WBGO. The gala is a fundraiser for the non-profit professional organization that promotes coverage of jazz in all media. The JJA gala at City Winery will also feature announcements and presentations of the Awards to the winning nominees in 39 categories of excellence in jazz music and journalism. "Jazz Heroes" from across the U.S. will be honored for their extra-musical jazz activism (there are no "A Team" inductees this year, the better to highlight that jazz activism now has mostly local rather than national impact). Light refreshments and beverages will be served, including Brother Thelonious Belgian Ale supplied by sponsor North Coast Brewing, Celebrity Jazz cognac from Awards supporter JTE Spirits, and wine from City Winery's own reserves. The general public may purchase tickets to the Awards gala in New York for $150, with discounts available for JJA Members. The Jazz Awards will be live videostreamed for free viewing online around the world. Free satellite parties have been convened to watch the Awards in Arcata, CA, Berkeley, Boston, Chicago, Nashville, Portland OR, Seattle, Tallahassee, Florida and Washington, D.C. The JJA Jazz Awards is the only broad-based, independent, international celebration of jazz excellence. Begun in 1997 as a collaboration between the Jazz Journalists Association and Michael Dorf (then executive director of the Knitting Factory, now director of City Winery), it has been produced annually since 1999 by the JJA as part of its effort to increase awareness of jazz throughout the U.S., North America, and the rest of the world through writing, photography, audio/video and new media productions.